Welcome. My iLoveLooe online shop sells quality items designed and produced right here in Cornwall. Proceeds are ploughed back into iLoveLooe to help support and develop the website. Anything you buy, really is appreciated. Thank you to everyone who ordered a Looe 2019 calendar, they went off in the post today (Thursday 20th December) so should be with you for Christmas – whoopee! The delay this year was down to me for which I apologise, I was short of work for months and then all of a sudden everything got busy again, so the calendar went on the back burner, so to speak. Needless to say, I will try and have them ready much earlier next year although this isn’t always possible due to not having taken all the photos! Knowing Royal Mail, I cannot guarantee your calendar will be with you for Christmas Day, however, they went off today so should be with you tomorrow or Saturday. For anyone in Looe, I will drop them off to you tomorrow, Friday. Merry Christmas to you all, if you have any questions, please drop me an email. 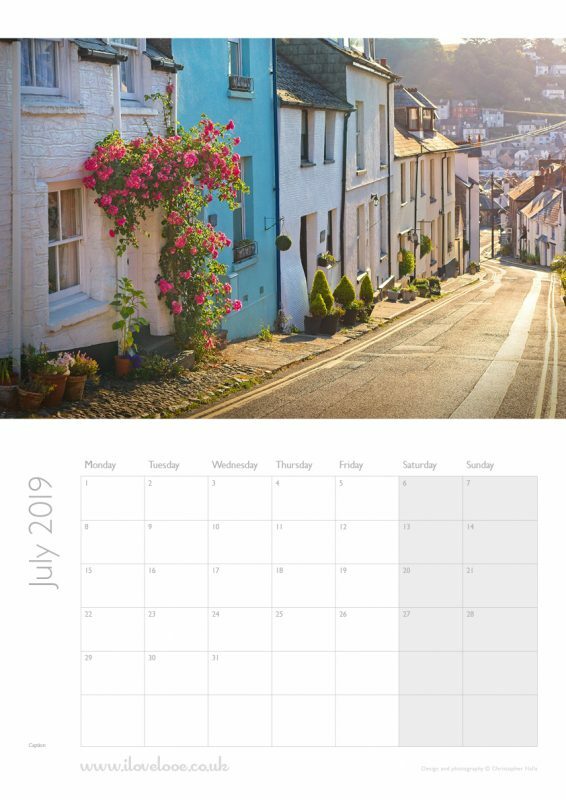 The Looe 2019 Calendar features 12 NEW seasonal photographs of Looe. From a snow covered Looe to bright, sunny mornings overlooking Looe Bay, each photo attempts to give a feeling of what it’s like here in Looe throughout the year. 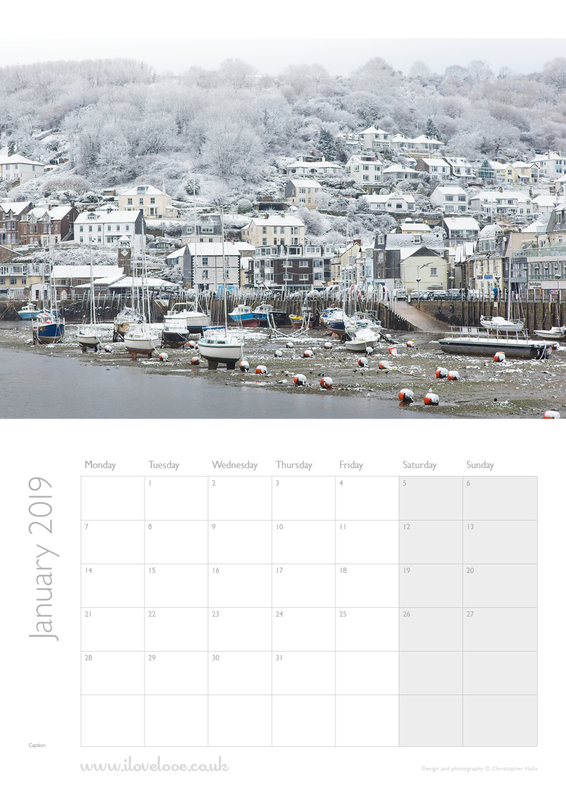 The new Looe 2019 calendar is a quality item having been litho printed in glorious colour. Each calendar is A3 in size with white wire-o binding and a loop for easy and convenient hanging. I personally wrap and post out each calendar in protective cardboard packaging to ensure it arrives safely at your chosen destination. Finally, my iLoveLooe Looe calendar is designed, photographed and produced in Looe. It’s unique, unavailable anywhere else and there are only 25 of them this year! I post by Royal Mail 2nd class to anywhere in the United Kingdom. Postage is included this year for up to 2 calendars to a single UK address. Kind words about the Looe calendar? Received calendar! Wow! Absolutely stunning! A year of gazing at my favourite place, interspersed with frequent visits to my own little place in Looe….if and when it eventually goes through!! Thanking you….just love it!! Thank you for your prompt service, calendar has arrived today perfectly package so no damage. Thank you again. Received my calender today, thankyou they are great photos. Wife very happy, hers came today. That is an awesome shot! There may be an element of luck but most of us would be walking away saying “ooh, shame I missed that, It would’ve made a lovely photo”. Buy one! It’s stunningly beautiful! Chuffed to little mintballs with mine. I’ve bought mine, everyday I can now look at Looe. Enjoy 12 beautiful images of Looe all year round. None of the images have been printed before, many have never been seen! Calendars are gifts that last all year! Does your office space need cheering up? This calendar will brighten up your working day no-end. With lots of room to write important dates such as birthdays, anniversaries or important meetings, this calendar is really useful. 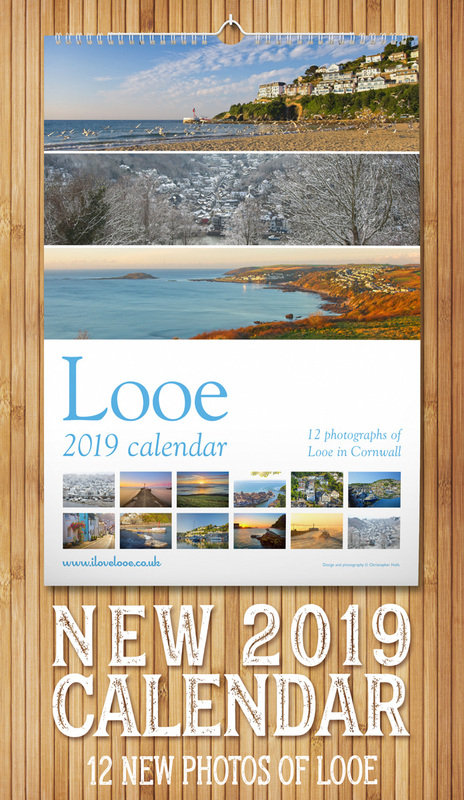 iLoveLooe Looe 2019 calendars are only available here on iLoveLooe. I’ll personally wrap and post your calendar to you by Royal Mail. Obviously, if you have any questions, just get in touch and I’ll be more than happy to help. Contact me here.